Click on the drop-down arrow to the left of the phrase "All Items" in the left pane to see the locations, or just click on a marker to get the address, cross-streets and phone number. Sam's Club is a membership-based warehouse store that carries food, fresh meat and seafood, deli items, frozen foods, bakery items, liquor, books, appliances, kitchen items, personal electronics, computers, cameras, automotive supplies, health and beauty products and more. It is a very popular stop for both locals and visitors to the area. Snowbirds who live in the Valley of the Sun will often make Sam's Club one of their first stops when they get to town. Even tourists and RV travelers know that some of the best prices on snacks, liquor, books, DVDs, and over-the-counter medications can be found at Sam's Club. Ready-to-eat foods are a hit with families. Don't forget that they also have pharmacies, hearing centers (in case you forgot hearing aid batteries! ), photo stores, optical centers and more. Yes, some people just go to Sam's Club to snack on samples or get cheap hot dogs and pizza at their food court. Shopping at a warehouse store is one way to save money, and products are often sold in large quantities. Most Sam's Club stores have a pharmacy, optical department, and a hearing aid department. In order to shop at a Sam's Club warehouse store you must pay an annual membership fee and show your card when purchasing products and services. Yes, of course there are! Costco is another membership warehouse store that is popular. You can get information about local Costco locations here. Everyone in the United States is familiar with Walmart -- yes, we have many Walmart stores in the Phoenix area. 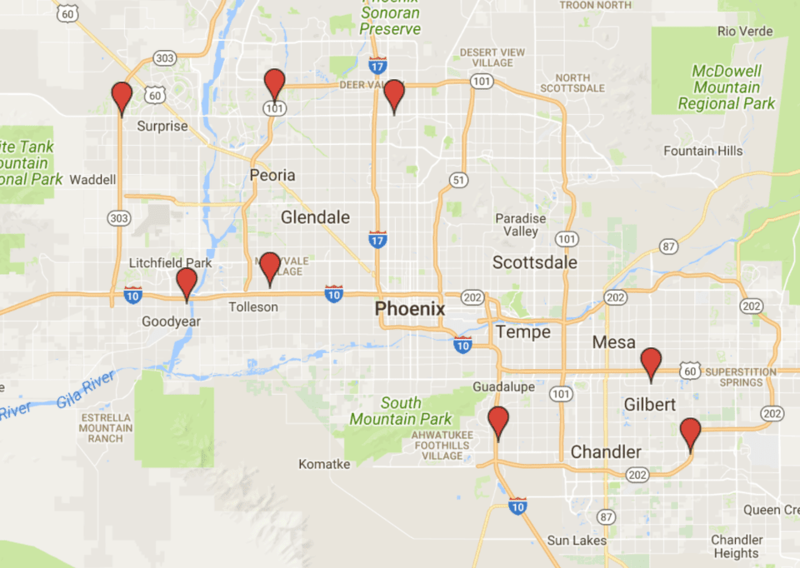 Here is a list of Walmart locations in and around Phoenix. It includes details about which ones are open 24 hours per day. There is no membership requirement at Walmart.